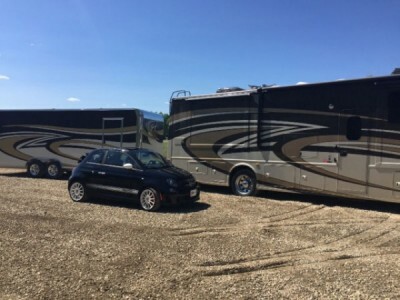 2014 Thor Palazzo + Fiat + Trailer Combo. 2014 Thor Plazzo 35ft 350 Cummins Diesel, six speed Allison transmission, freight liner chassis excellent condition. 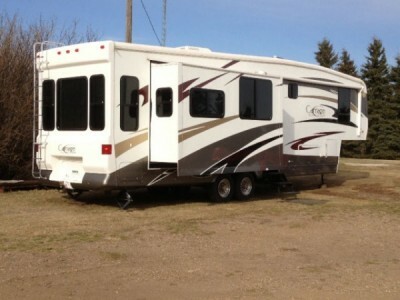 three slides, satellite, stainless appliances, washer and dryer, king bed, brown and tan leather interior. 2014 Car hauler, all aluminum, 26 foot, decal package to match motor home. 2014 Fiat convertible, black red interior, high out put super charged engine, under 1500 km. Please call 780-897-4343 to view. 2006 Forest River Cardinal 30FK Trailer. Quality built with blue and white interior. 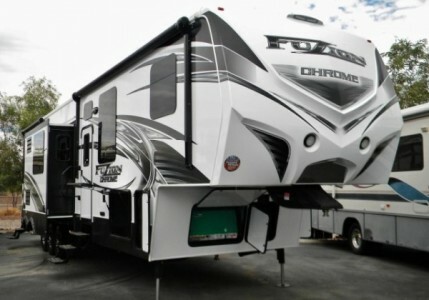 Top of the line RV built by Forest River. One owner, no pets, no smoking, no children. Front kitchen and window with rear bedroom model. Microwave, shower and oven have never been used. Low mileage, only lake and back once a year. INCLUDES: 20 ft Carefree Add-a-room and breezeway. Mattress upgraded to Sears-O-Pedic individual coil double, also has bed lifter. Heavy duty load leveler hitch. 2-30# propane tanks with propane. Electric heated and enclosed tanks. Enclosed under belly. Tinted clamp ring thermo pane windows with day/night shades. Four 6 volt deep cycle batteries. 12 volt battery disconnect. 50 amp service. Command centre for controls. Quick winterize system. Spare tire and cover. Deluxe awning with centre support and quick water release. Linoleum throughout. Oak free standing table with pull out extension and glass cover top and oak chairs. Flush floor hydraulic slide out with laminated walls and roof. Oak accent on slide. Eavestrough extensions. 10CF Refrigerator with Cathederal raised oak panel doors with adjustable temp control and freezer. 3 Burner hi-output 22" range with oven and folding cover and range hood. 13.5BTU A/C with quick cool. 30M BTU furnace. 10 Gallon gas water heater. Black tank flush. Neo angle ABS shower and surround with glass door. Porcelain stool with foot flush. 6+2 surround sound system with CD. Phone jacks. Cable TV hook ups, TV antenna and booster. Oak cupboards with raised cathederal doors. Oak edged counter tops. Upgraded door glides. More info and pictures available. Please call 780-875-4491 to view. 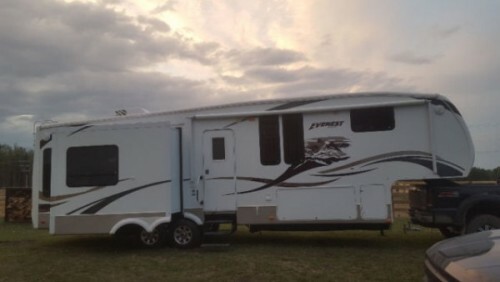 2008 Keystone Everest 320T Fifthwheel. Excellent condition Everest 5th wheel 36ft RV, Full winter package including Karma Kreations fully insulated canvas insulated skirting. Electric Fireplace. 3 slides. California King bed in master. Upgraded to efficient furnace/high speed motor. Hyde bed couch. 2 TVs/satellite prep. AC. Rear 7000lb hitch with 7 way wiring. Washer/dryer prep. Microwave/Pantry/central vacuum. 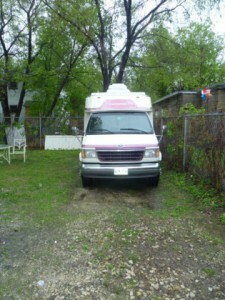 Outdoor shower, all compartments heated, exterior is immaculate, always waxed every year. Upgraded hydrolic push button Jacks, insulated R20 underbelly, u will never be cold in this unit. Selling because we want something smaller. Located in Drayton Valley. Please 780-514-6226 to view. 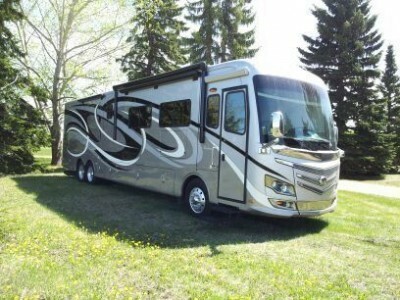 2008 Glendale Titanium 36E41 Toy Hauler. 10 foot garage with ramp rear door, complete enclosure as well as sun screens. 12300lb. dry weight. Ducted air furnace. Wrap around counter, double sink, stove & oven, microwave, large fridge. Tri axle, slide out side deck with patio door 7x6, comes with netting to close it, 3 slides, Island kitchen with double sink. Excellent Condition. Please call 587-269-0409 to view. 2007 Dutchmen Victory Lane 28SRV Toy Hauler. with garage will accommodate a side by side or any other toys, unit is in exceptional and clean condition and only used twice a year and we would like to downsize as it is too big for us. Please call 780-538-2689 for details. 2014 Keystone Fuzion 404 Toy Hauler. 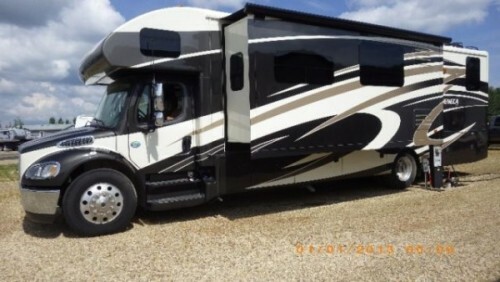 Toy Hauler, 3 Beds, Stainless Steel Appliances, Front and Rear Heat & AC, Leather Couch, 3 Slides, Built In 50L Cummins 5500watt Generator, Built In 150L Fuel Station for Toys, Samsung TV, Attached Satellite TV Dish, Sony Sound System (SiriusXM Ready), Interior and Exterior Speakers, 2 Electric Awnings, Hydraulic Self-Leveling Jacks, Blizzard Package, 90% Tire Tread. Please call 780-712-9493 to view. 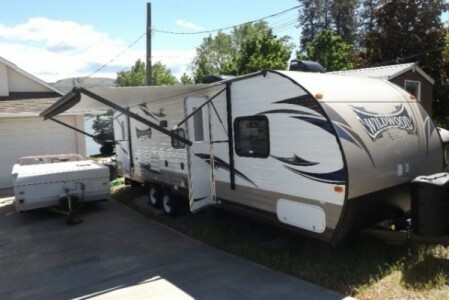 2010 Palomino Sabre 32BHOK6 Fifthwheel. 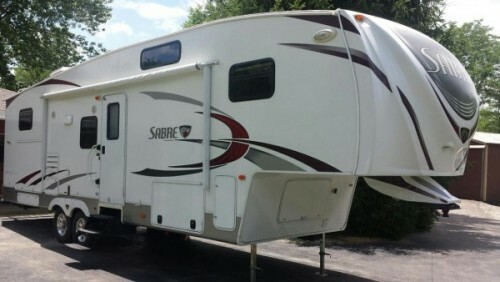 I have a 2010 Sabre fifth wheel trailer for sale. The unit has a living room slide and a master bedroom slide. At the rear of the unit is a bunkhouse with three beds. There is only three beds to allow space for the outside kitchen that is equipped with bar fridge stove and pull out counter. This trailer was used at most two or three times a year with the longest trip three hours from home. My pics dont want to upload so call or text 780-603-8989 and I can send them to you direct. 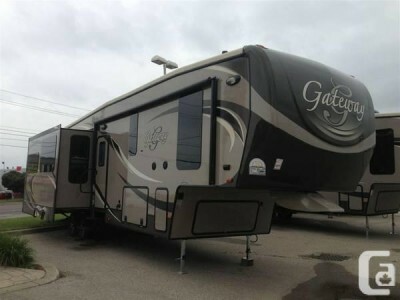 2014 Heartland Gateway 3200RS Fifthwheel. 37ft. Like new condition! More pictures available upon request. For more information, please call 780-926-0242. 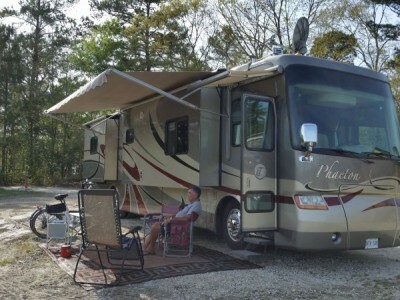 2007 Fleetwood Revolution LE42N Class-A Motorhome. This unit has EVERY bell and whistle you can think and or dream of. Only has had one owner and was well taken care of sadly we are selling due to we don’t use it as much and would be better off going to someone who would enjoy it, Maintenance has been maintained on the unit, IT'S A MUST SEE, looks like a bus but looks like a normal sized apartment even has entertainment in the under storage for those exciting outdoor adventures, You could even do a movie OUTSIDE under the stars with built in surround sound inside and out. This unit has everything you can see in the pictures. Chassis Spartan Mountain Master Chassis Engine Manufacturer. Caterpillar Engine Model C9 Fuel Type Diesel - 400HP. Interior: Obsidian. Air Conditioners. Built in Vacumn system. And Here is some more. Appliances. Convection. Microwave Enclosed. Water Tank. Oven. Refrigerator. Stove. Water Heater. Electrical: 50 Amp. Air Conditioning- 3. Generator. Equipment: AM/FM/CD DVD- Interior/ Exterior. Fire Detector. Extinguisher. 3 LCD HDTV. LP Detector. Stereo System. Exterior: Backup Monitor. External Shower Full Body. Paint Ladder. Hydrolic Leveling Jacks. Power Awning. Power Entrance. Step Skylight. Slideout Thermal. Pane Windows. Tinted Windows. Interior/Furnishings. Dinette Glass Shower. Medicine Cabinet. Overhead Cabinetry. Sleep Number Pillow Top Mattress. Sofa Beds. Corium Countertops. Wardrobe(s). Enclosed Bathroom. Please call 403-391-1167 for More pictures or to view. 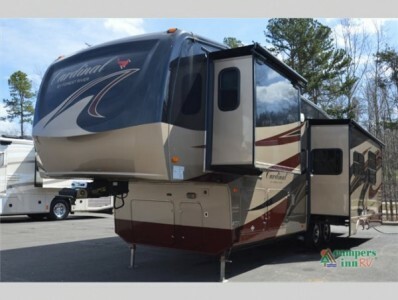 2015 Jayco Seneca 37RB-C Class-C Motorhome. Freightline chassis, 6.7L 340HP CUMMINS Diesel engine, ALLISON trans, rear air suspension, 8KW diesel generator, two slides, dual ROOF AIR, power leather drivers and passengers seats, in motion SATELLITE DISH, 1800 watt inverter, 32in TV AM/FM/CD exterior entertainment center, convection microwave, rear and side CAMERAS, HYDRAULIC leveling jacks, electric awning, 32in LED TV living room, 22in LED TV bedroom, washer/dryer combo, heated holding tanks, REAR FULL BATH ROOM AND HALF BATH CENTRAL, hot water on demand and MUCH MUCH more. Please call 780-913-2710 to view. 2012 Monaco Diplomat 43DFT Class-A Motorhome. We must sell our beautiful motorhome. Will negotiate. Diesel but def not required; Currently in storage near Edson; 3 slides with full wall on street side; kitchen on street side where you want it; RESIDENTIAL WASHER AND DRYER AND FRIDGE; bath and 1/2; king bed select comfort mattress; 4 TVs; new RF MOGUL satellite dish; electric fireplace; aqua hot heating system; spec sheet with MSRP available; power day/night shades on one piece front windshield; 12 air bag levelling, no jacks; electric power cord reel and water hose reel; back up camera; Garmin GPS nav system; RCA home theatre. Please call 780-464-7075 to view. Available to view after August 24, 2016. 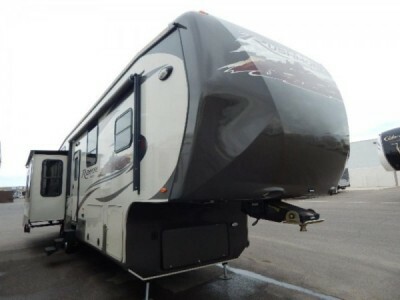 2013 Crossroads Rushmore 38CK Fifthwheel. Was home away from home while we waited for our house. LR wall unit with 42” LCD TV, DVD player and sounds around. One leather couch (pulls out to double bed) and 2 leather chairs. Hutch with free standing dinette with two dinette chairs and two folding matching chairs. 19in LCD TV and roll-away kitchen island, side by side fridge with ice maker, stove with oven and convection microwave; lots of cupboards, ceiling fan, fantastic fan with rain sensor, and vacuflow. 3-piece bathroom with linen closet, sky light in shower, and fantastic fan with rain sensor. Master has one slide, king size bed with storage underneath, 32in TV in wall, lots of closets and one is prepped for stackable washer/dryer. 4 slides and insulated windows with day/night shades throughout. Air conditioning, electric awning, Roto-Flex pin box, IntelliJacks, Fire extinguisher, LP and smoke detector, RVIA and CSA seals, RV mat and Satellite Tripod included. Please call 403-471-3424 to view. 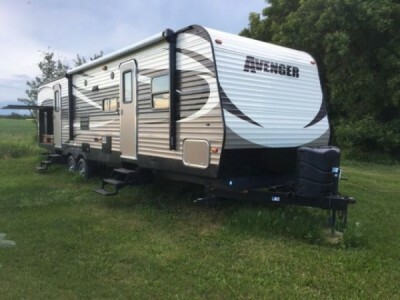 2014 Prime Time Avenger 32BHS Trailer. Like new. Only about 500 Kms on it. I have a 2014 32BHS Camping Trailer for sale. I bought it this spring to go down south for a project which slipped through and I dont need it now, its only been used a few times last year from previous owners, and I haven't used it at all my self this year. Sleeps 8 comfortably. Outside kitchen with fridge and cooktop. 2 slides with bunkhouse. 2 propane tanks with automatic switchover. Fridge that can run on propane or electricity. Outside shower. No Low Ballers. Please call or text me at 780-608-5107. 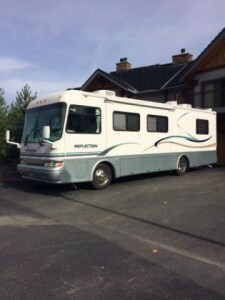 2006 Tiffin Phaeton 40QDH Class-A Motorhome. Quad Slide, 350 Cat Engine, Onan slide out generator. The Phaeton is Tiffin’s top seller for many years. Excellent Condition!You will not be disappointed!Comes with all the extras: 2 new Samsung Smart televisions in living room and bedroom, outside basement TV with fridge, all new (6) "steering" tires (2015), 4 new coach batteries (2016), new exhaust pipes (2016),four door Norcold fridge with icemaker-Norcold fridge cooling unit replaced (2014),ultra leather cream couches, driver and passenger seat, one piece windshield, one touch rooftop Shaw/Direct satellite, power door and patio awnings, auto leveling, rear view camera with sound, 2 ducted ac units with heat pumps, central vac, pass through storage with slide out tray, expanding dinette table with four chairs, expand an island in kitchen adding counter space, convection/microwave and 3 burner gas stove, cherry cabinets, washer/dryer, queen size bed in rear, large shower with seat, front and two side window sun screens included,tire covers included, new front window privacy curtains, all maintenance and repair records available, non smoker and pet free, Not included but at a reasonable price a 2012 GMC Terrain with tow package. Please call 613-276-5639 or email rikvik56@gmail.com to view. 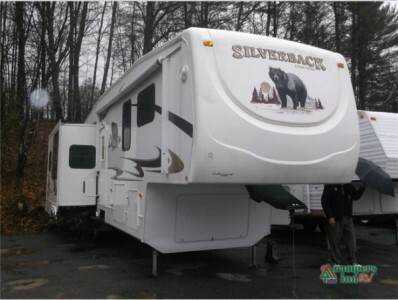 2008 Forest River Cedar Creek 29LRGBS Silverback Fifthwheel. 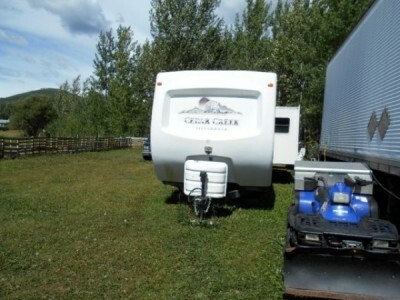 5th wheel camper trailer, winterized, heated tanks etc. rear kitchen, excellent condition just some decal fading. Please call 780-871-2588 to view. 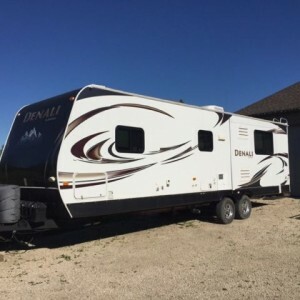 2012 Dutchmen Denali 285RE Trailer. Excellent condition, used one season. All weather package/4 season trailer. Solar panels. 3000 watt inverter. Second furnace. Under skirting to enclose trailer. Paid $55000 plus taxes. Aluminum Wheels. 2 Axles. 15 Inch Radial Rear Tire. Exterior Mounted Spare Tire. Electric Drum Rear Brake. Please call 204-807-4912 to view. 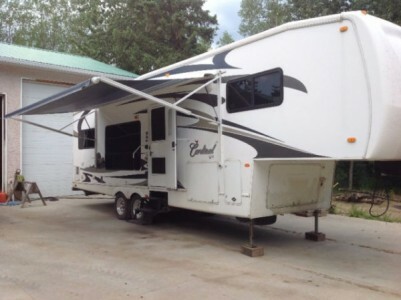 2008 Forest River Cardinal 30Ft Fifthwheel. Stored in heated shop in winter. No smoking and no pets inside ever. Air Ride hitch. Push Button Awning with wind and rain sensor. Awnings over slide outs. Exterior step has 3 stairs. Front power jacks. Dinette chairs still in plastic protective cover. TV (never used) and stereo included. Exterior speakers. Space Saver Coffee Pot. Double Sink. Built in vacuum. Lots of closet space. Heated tanks. Air conditioning. Insulated under carriage. Night shades all windows. Fantastic fan. Couch (with hide-a-bed) and two chairs in living room area. Ceiling fan. New Batteries. Good rubber. Dual 30lb propane tanks. 50gal fresh water tank. In very good condition. Please call 780-445-0509 to view. 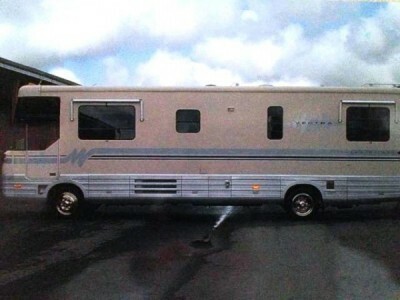 1994 Chinook Cascade 21ft Class-C Motorhome. Recent $6000 reconditioning. Transmission, Brakes, Electrical & Rust Proofing. Muffler system, alternator, batteries, tires. Unique Comfortable Floor Plan. Ready to Go. Please call 204-791-9923 to view. 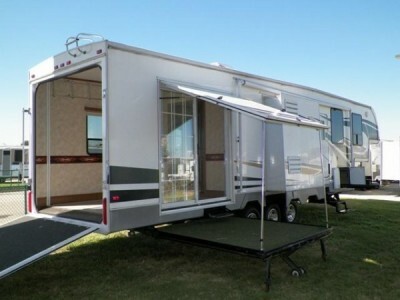 2011 Jayco Eagle 324BHDS Trailer. Has great outdoor features with the attached BBQ and outdoor kitchen and shower. Inside there is a spacious "kids room" with 2 top bunks and a J-Cube that turns into a queen. Really nice interior colors and plenty of room for a big crowd. Comes with hitch and sway bars and would consider including the 3100 Powerhouse generator as well. 8500lbs dry weight. 35ft bumper to hitch. Please call 403-506-0456 to view. 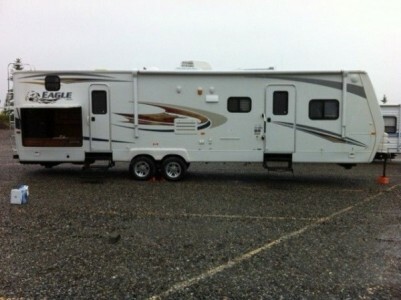 2011 Keystone Cougar 293SAB Fifthwheel. Includes tripod for front hitch, extendable heavy duty rear bike rack or cargo rack, HD flat screen TV, radio, DVD player, electric awning, 2 new deep cycle 6 volt batteries, outside shower, power jacks, polar package. Exterior is hardwall. Queen bed in front bedroom, full main bath. Second back bedroom had 2 adult size bunks with additional trundle bed under lower bunk. Second bedroom has its own bathroom, with toilet and sink. Fantastic Fans in both bedrooms. Room to sleep 9. In great condition. Please call Colin @250-574-0522 or (home) 778-469-4801 to view. 2015 Forest River Wildwood Ultralight 31Ft Trailer. Enjoy the outdoors this season in a brand new, very low hours. 4 year extended warrantee. Complete tow package with sway bars, flat screen television, stereo, exterior finish protection package. Living room slide and many added features. Please call Steve at 604-910-1573 to view. 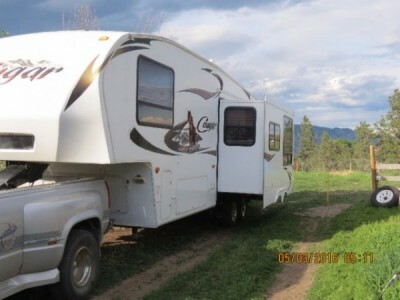 2006 Carriage Cameo 35Ft Fifthwheel. Excellent condition, triple slide, hard body, remote ceiling and fantastic fans, MorRyde hitch and suspension, electric fireplace, corian countertops, thermal windows, AC with heat pump, central vac, new skirting with dog house included. 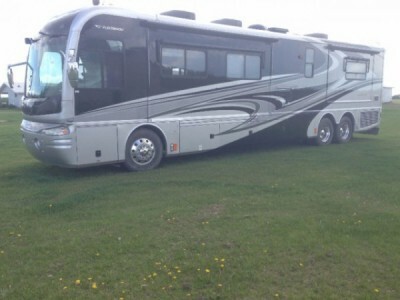 Reasonable offers or will consider trade for small class-C motorhome of equal value. Please call 780-374-3960 to view. 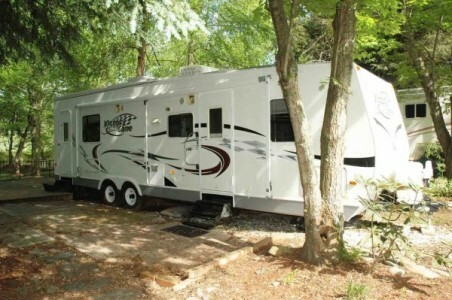 2007 Featherlite 8546 3 Horse Weekend Special Fifthwheel. 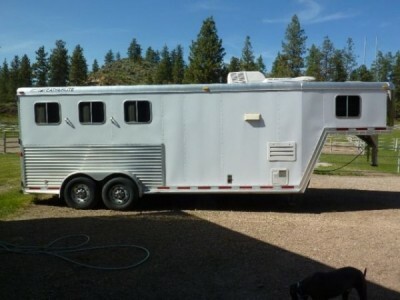 3 horse gooseneck, hot & cold water, refridgerator, freezer, shower, toilet, 2 burner stove, microwave, sink, double bed, cupboards, stall area sprayed with liner box rubber + regular floor stall mats, awning, heater & AC, additional water tank for horses. Please call 250-462-6365 to view. 2007 Forest River Reflection Fifthwheel. Diesel in excellent condition, one large slideout. New tires, new brakes, hardwood floor, granite counter top. New cook top, New awning. Alberta registered, low mileage. Please call 403-793-3940 to view. 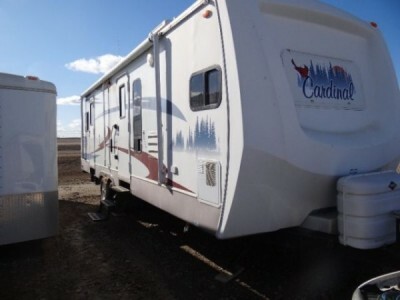 2010 Forest River Cardinal 3100RK Fifthwheel. This trailer is a one owner aprox 18,000km new tires 2yrs ago 12 ply, has two slides, solar panel, sat tv, two 32in TVs queen bed built in vaccum air cond, has awnings on all windows kitchen is a ladys dream also plummed for washer and dryer color is gold black and brown and is solid paint. Please call 250-260-7714 to view. 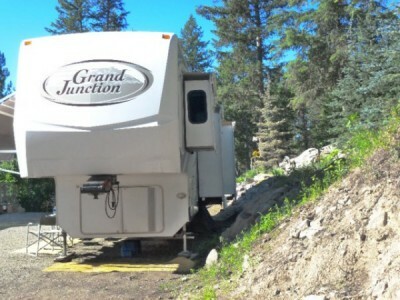 2007 Dutchmen Grand Junction 35Ft Fifthwheel. Bought from retired couple, sat in their yard. Now sat in our yard 4 years. 4 slides, fireplace, double sinks, oak cabinets, wired for washer/dryer, top of the line appliances, huge generator, canopy, WE used it 3 times. Please call 250-446-2150 to view. 1994 Winnebago Vectra 35Ft Class-A Motorhome. Diesel pusher, new tires, wheelchair lift, in excellent condition. Please call 250-832-4551 to view. 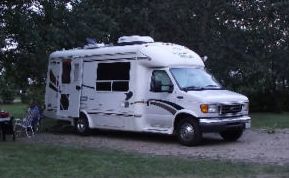 2005 Ford Vanguard 22Ft Class-B Motorhome. 1 slide, awning, generator. 4 pcs bath. Fully loaded. Please call 780-445-8000 to view. 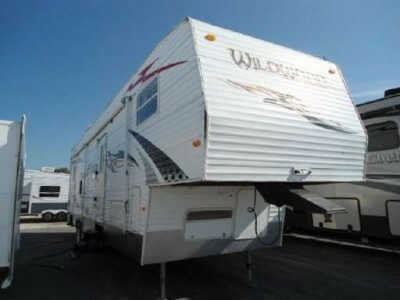 2009 Forest River Wildwood Sport 32SR Toy Hauler. 35 ft 5th wheel with air ride hitch, $4,000 worth of solar (510 watts. 2 solar systems 250/260 watts. 2000 watt inverter with 2 batteries. Loads of space 10x8 toybox. Please call 250-378-5928 to view.